Think Home-made Tortillas are a little out of your league? Shame on you! Even my kids can make these ones, and they have. It’s another recipe for us to add to our Kids Cookbook this year. That’s It! How El Cheapo is that? Place all of the ingredients in a large mixing bowl and stir to combine thoroughly. I used my hands, because I find doughs and pastries always come together and have a better texture if you use your hands. Isn’t that true of Pasta making too? I actually don’t know because I have never made pasta, but I have watched my son and hands it is. When all of the ingredients have combined transfer to a floured surface and knead for a minute or so. Divide the mixture into 16 balls of equal size. Roll the balls out until they are quite thin. The first couple of times I wound up with all kinds of shapes, and this was especially true when I let the kids have a go. 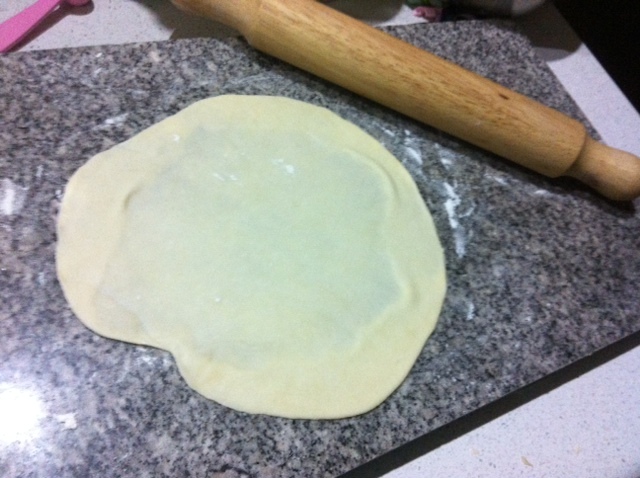 But then I figured out that if you roll out from the centre, first to the top, then to the right, then the bottom, then to the left side, then back to the top (in other words moving around the circle in a clockwise direction), you actually end up with something that closely resembles the shape of a tortilla. Lightly oil or spray a fry pan and cook each tortilla for a minute or so on each side and you’re done. 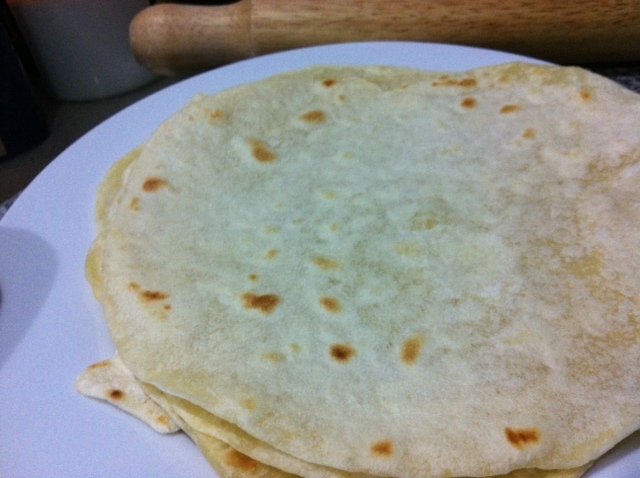 You’ve made your own Tortilla! Now, what are you going wrap up in these beauties? Well, stay tuned, because I also came up with a spectacular recipe for Shredded BBQ Beef and one for Coleslaw. A perfect match. Notes: After lots of practice I discovered that you don’t need to re-oil your pan after each tortilla, they cook better with a minimal amount of oil. Using a non-stick pan is a good idea too. I should also mention that this magnificent meal combination was inspired by BabyMac’s post on easy holiday food.